Discussion in 'Regulated (Voltage / Wattage / 3.7v/ Temp Control)' started by Ephraim, Sep 8, 2018. The Hex Ohm specs say it runs at 6 volts. Does it always run at 6 vomts? Im wondering because Im trying to figure out what wattage Im running on based on my ohms. 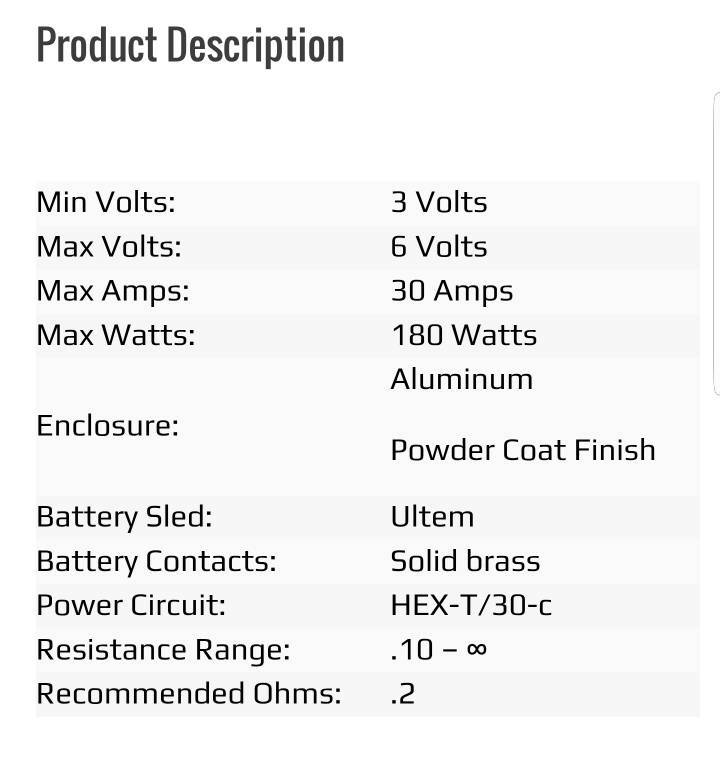 So can the Hex Ohm run under 6 volts or is it 6 volts continueous? Not sure about the hex but you should look into an ohms law calculator. Vapetool has a good one. I have rapid tables on my phone. I found out the Hex Ohm puts out 6 volts if u have the potientiameter turned all the way up. The hexohm V3.0 has a potentiometer dial and can operate from 3-6 volts. I have 4 of them. Chokeslam, MWorthington, Letitia9 and 1 other person like this. Also the lowest build the V3.0 can run is .10 ohms. The hex runs from 3 to 6v. At half way you are around 4-4.2. Honestly I just make sure I have good batteries for my build; then, seti it and forget it. MWorthington and VAPEROXX like this.